On Thursday, December 10th, the NRH Economic Development Department held our 24th Annual Business Appreciation Luncheon at the Grand Hall at the NRH Centre. Each year, the City hosts this event to thank the 1,200 businesses that create a vibrant and diverse economy in NRH, provide services to the City’s residents and visitors, and make NRH a wonderful place to live and work. This year, over 250 guests joined the City’s elected officials and staff, as well as other local dignitaries in celebrating another successful year of business in North Richland Hills. Mayor Oscar Trevino and Economic Development Director, Craig Hulse, welcomed guests and provided updates on the City’s growth and the many new and exciting developments completed this year and beginning in the coming year. Those in attendance were also treated to an insightful keynote address from Mark Followill, the play-by-play announcer for Dallas Mavericks television broadcasts. Mr. Followill spoke about the important value that our area and its businesses add to the Dallas-Fort Worth region and answered guest questions about his experience and involvement with the Dallas Mavericks and other sports franchises. 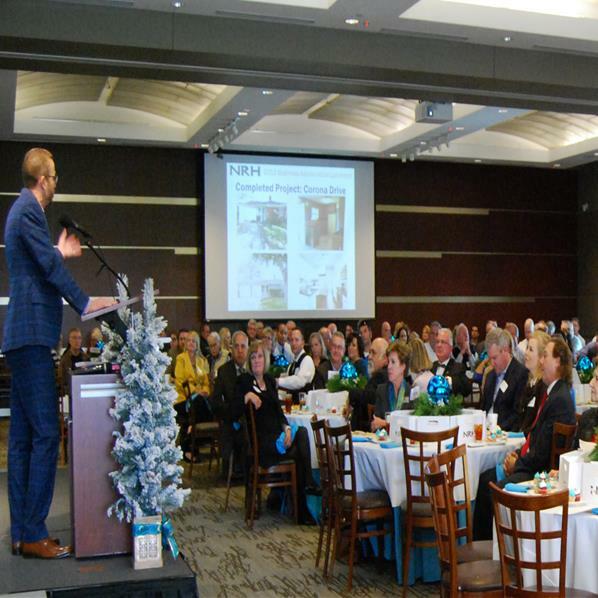 The NRH Economic Development Department would like to extend special thanks to guest speaker, Mark Followill, the Grand Hall at the NRH Centre, Cristina’s Fine Mexican Food, Sinsational Cakes Bakery, Fox Rental, and Simply Elegant Weddings & Special Events for helping make this year’s luncheon another great success. Missed this year’s luncheon? Click the link below to see the slideshow detailing all of the new and upcoming development in North Richland Hills.